Lesson Plan: How Are We Alike and Different? 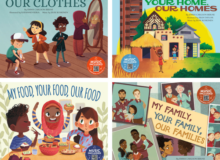 Exploring our differences and similarities from a young age is one of the best ways to help children develop an appreciation for our cultural diversity. This interactive lesson plan offers classrooms the opportunity to learn about their different cultures through art and language art projects. Use the All About Me book for personal reflection. Get STEAMing: culture fair and technology extension activities are also included! Download or stream the How Are We Alike and Different? songs for free!